If you live in or around Cambridge you may have heard of the Greater Cambridge City Deal. It is a deal by which central government is providing finance to the Greater Cambridge area with the aim of “[helping] secure future economic growth and quality of life in the Greater Cambridge city region“. More information about the deal between central government and Greater Cambridge can be found here. The City Deal is broken down in to the four main areas of transport, housing, skills and innovation; and at the moment the focus is on transport, with a key City Deal consultation closing on Monday 10th October (tomorrow!). I had hoped to find the consultation on the ‘consultations’ page of the City Deal website, but when I clicked on the link there was no mention of this consultation. Instead you have to visit www.gccitydeal.co.uk/congestion. The City Deal say they are seeking people’s views from 11th July to Monday 10th October, but they have not given a time cut off – so it’s not clear whether the deadline is the beginning of Monday or the end of Monday. Given the ambiguity, I would hope that they will still consider all responses received at any time on Monday itself. THE CONSULTATION CLOSES ON MONDAY 10th OCTOBER, SO THERE ARE JUST A FEW HOURS LEFT TO COMPLETE IT! There are various elements to the City Deal’s transport proposals and most of these will affect Mill Road, whether directly or indirectly. Through chats with lots of local residents and businesses I’m hearing that although a number of local people seem to be aware of some kind of transport discussion, most haven’t seen a leaflet (I don’t think the City Deal delivered these through doors in Cambridge, though a kind local resident put some through some of our doors in the Mill Road area just a few days ago) and many had no idea that there was a consultation about to close. As there has not been an official City Deal meeting held in the Mill Road area, this is not surprising. Of those that are aware of the proposals, many did not realise what the implications might be. For example, I have spoken to a few people about the proposed Peak-time Congestion Control Points (PCCPs) that are planned for Cambridge (including one on Mill Road) and most assumed that there would of course be exceptions for local residents and businesses. However, I was at a City Deal meeting recently and was told by officers that exceptions would not be made in these instances. The Peak-time Congestion Control Points (PCCPs) are points at which only buses, cycles and emergency vehicles will be given permission to cross during peak hours (expected to be 7-10am and 4-6:30pm) without incurring a fine. ANPR (Automatic Number Plate Recognition) cameras will be in place at the points and will fine all vehicles that pass the points but do not have permission – expected to be a fine of £60. There is a lot of concern about the PCCPs, as it is felt that there are a lot of exceptions that would need to be made – and the amount of exceptions would make it unviable and indeed cost the City Deal/Councils more in administration. For example, local businesses are understandably concerned that this would affect their ability to receive deliveries from their suppliers, their ability to deliver to clients and the ability of customers to shop with them. Rather than bringing people to high streets, this will discourage shopping and affect the local economy. Having worked at local companies that receive deliveries, I know that you need to be flexible about when you can receive them – otherwise suppliers just won’t deliver to you. Will PCCPs affect people’s health, care and wellbeing? Another concern – perhaps the greatest concern of all – that I have heard from a number of people is that regarding health and care. For example, many people have carers come and visit them at their homes in the Mill Road area and wider Cambridge, or live in these areas and travel to other parts of the city to care for people; or they help people by doing their shopping for them. Some of these might be more formal care arrangements, often through a private company, but many are more informal arrangements – e.g. between friends and contacts. Some carers balance work with caring and may carry out caring duties on the way to work (peak time), and patients who need help getting out of bed and preparing breakfast will undoubtedly need carers to attend some time between 7 and 10am. If these carers and helpers cannot travel to/from those who they’re helping at any time, then this could greatly affect these formal and informal services. For example, if a carer cannot travel by car to visit patients, they may not be able to visit at all. Although we should of course be aiming to reduce travelling by car, this is an area where it may not be practical to do so. For example, carers often have to carry medical equipment, shopping, cleaning equipment and other colleagues with them – and this would not be possible at peak times. Care is necessary at all times of day, not just outside of 7-10am and 4-6:30pm. The other concern in this regard is that private care companies would greatly reduce the care they provide, and charge more for what care they do provide (i.e. pass extra costs on to customers), if they are regulated by PCCPs – for example, it would take longer for carers to travel between patients, and therefore reduce what they are able to do. The introduction of PCCPs could also affect the ability of Cambridgeshire County Council Social Services, community nurses, Papworth Trust, community rehabilitators and those providing re-ablement to patients leaving hospital, to provide care and support to people that need it when they need it, therefore reducing people’s quality of life. If the amount of day when they are able to do this reduces, this will limit the number of people they can help and the extent to which they can help them. Another health-related concern is that it could delay patients attending doctors surgeries, health centres, out of hours doctors services and Addenbrookes. I have learnt from experiences with my own family and friends recently that Addenbrookes now will often contact a patient on the day or the day before, to ask that a patient attend for an appointment. This means there are no official appointment letters (probably a good thing, as Addenbrookes try to reduce their reliability on paper) and patients might have just an hours notice to attend for an appointment. If people are having to take large detours to get to hospital, they could miss these appointments. Although some patients could travel by bus, many will not be able to – bus journeys in Cambridge are often rough (with drivers accelerating and decelerating suddenly) and not good for those who are already sick and suffering with nausea and other symptoms. Some patients (e.g. oncology) often have to visit Addenbrookes every weekday for several weeks, with the following day’s appointment often being given/updated at each appointment; and with Papworth moving to Cambridge in April 2018, the number of oncology appointments in Cambridge will greatly increase (thousands already use Papworth at it’s current location each year). These are appointments where friends and relatives might drive the patient to Addenbrookes (Addenbrookes does not have the facility to provide transport themselves). It is possible to claim back mileage in some cases, and I guess with the introduction of PCCPs this would mean that people’s mileage claims would potentially be larger – costing Addenbrookes more money. Those of you who have tried to get a doctor’s appointment in Cambridge recently will be aware that most surgeries operate a system by which you have to be one of the lucky handful of patients to phone them at 8:30am sharp to get an appointment on the same day, and that if you don’t take the given appointment (which might be just a few minutes later) then you are likely to have to wait anywhere between two and four weeks for an appointment. PCCPs could affect the ability of people to get to appointments on time, which in turn could affect the number of people attending A&E (people should of course only visit A&E in an emergency, but with no minor injuries units or urgent care centres in Cambridge, A&E attendance is ever-increasing). Also, depending on the condition that the patient needs to see the doctor about, they may not be able to walk and so will need to travel by car. Doctors also carry out home visits and these are typically done either in the beginning part of the day or end of the working day i.e. peak hours. Doctors travelling in their cars to patients at home are not emergency vehicles (and therefore are not exempt from the £60 fines), although the patient is obviously in some need if they cannot get to a surgery themselves. The PCCPs could affect the number of home visits a doctor does, or indeed whether they do them at all. As a local resident, I can thankfully get most things I need on Mill Road and so will probably not go in to town during peak hours unless I have time to walk there and back (a minimum one hour’s round trip). But I can think of occasions where it would be useful to be able to drive in during peak hours – such as with a friend or relative who needs to visit town but who is unable to walk very far, or who is recovering from an injury. Childcare is also an issue. During peak hours there are a lot of journeys being made where people have to drop their children off with childcare providers/family, before making their own journeys to work; and these journeys are often already made on a very tight schedule and routine, especially where people have to drop off children at more than one location. Having to make longer journeys may mean that it’s just not possible to do the journey and get to work on time. The City Council’s own refuse vehicles and other Council vehicles will also have to pay the fines for passing PCCPs (i.e. a refuse lorry is not an emergency vehicle, bus or cycle) and these vehicles typically do their collections throughout the City from 7am on weekdays. I wonder how much these fines will cost the City Council and how this will affect their operations. Have people been consulted on the planned PCCPs? Apparently the discussions have been going on since July, but I (and many others) was not aware of any official City Deal events about the Mill Road congestion control point, and have only recently found out about it and that apparently there was an event held on Hills Road about the congestion points affecting Mill Road (rather than hold an event in the Mill Road area itself). Although some political parties have held their own events, I think most local residents look to an official notification or event (rather than a party political one) for confirmation, and so will have missed some events; and without leaflets being delivered to every address locally, people just won’t be aware. Although some people will be aware of articles in the local press, it’s worth noting that Cambridge News circulation dropped by 50% between 2001 and 2011 and that people are increasingly looking to other sources to get their news. People are concerned about the proposals themselves. People are also concerned that they have not had time to consider the proposals properly and respond appropriately. On Thursday last week, there was a protest against the PCCP proposals in Cambridge (more links to information about the protest are here and there are further protests planned soon). There have also been specific concerns raised by local commentators (such as this video and this blog post), teachers, vets, Mill Road traders, local councillors, social scientists, local community groups (like this one), charities (like this one) and local businesses, (including Fitzbillies) and small businesses, not to mention several local residents and employees (like this example from my Twitter feed); and there have been various petitions set up too, including one on the Change.org website and one set up by a collective of local businesses. What else is in the City Deal proposal? There are a number of elements to the City Deal proposals regarding transport. These include some very welcome initiatives, such as the Chisholm Trail and other cycling schemes. However, it seems that there is still a lot of work to do in order to secure/improve the quality of life for people living in and around Cambridge. For example, there is a proposed busway planned for Cambridge to Cambourne (which has received a lot of opposition), but several bus services to/from villages have been cut in recent years and therefore need bringing up to a reasonable standard before such schemes can even be considered. As Cambridge is growing and house prices are increasing (whether renting or buying) many people are having to move out of the City altogether and out to surrounding villages. But several bus services have been cut, meaning those who thought they were moving to a commutable area are now having to drive in to Cambridge to work (for example a morning bus might get someone from Comberton to Cambridge, but following timetable changes over the last couple of years they would now have to catch the evening bus by a certain time – meaning they could not work late if needed; or those who do shift work often can’t get buses at all) and also for pleasure (many villages have no buses on a Saturday evening or at all on a Sunday). This works both ways, and means Cambridge residents often can’t consider jobs (or social activities) in some of the surrounding villages, due to lack of public transport. A lot of the buses that do travel in and around Cambridge seem bigger than needed, therefore reducing some of these to single decker buses might help too. If Cambridge is going to house all the staff moving to Cambridge, as well as existing residents who are inappropriately housed in the City and surrounding areas, then transport must be given a certain amount of priority. If people cannot afford to live in Cambridge itself, cannot commute to/from Cambridge by public transport because there aren’t any buses, and cannot afford to commute because buses are so expensive (often twice the price of London buses), then we are likely to see the detrimental effects more acutely as time goes on. Although congestion is obviously an issue that we need to address in and around Cambridge, it seems the PCCP proposals have highlighted a number of adverse impacts and unintended consequences. There will be effects on residents and local businesses which will affect the local economy, but most concerning of all are the impacts on health, care and wellbeing. Indeed, it seems that far from the proposals “securing future economic growth and quality of life” (as per the City Deal aims), they could end up doing the opposite. Make sure you complete the City Deal survey (direct link also available here). The City Deal website says that people can respond to the consultation up to Monday 10th October – tomorrow! You can also email the City Deal officers at: City.Deal@cambridgeshire.gov.uk. Having been at a meeting with City Deal officers recently, they highlighted that people filling in the consultation (or emailing them) with specific examples, would help them assess impact. So please be as specific as you can with your responses. There had been a couple of last minute changes to the advertised line-up, but there were still six comedians on the bill and we were not disappointed. Trev Tokabi‘s observations on our cultural idiosyncrasies were pure genius – a lot of comedy is observational, but Trev’s delivery is perfectly timed and the more stupid he made us look the more we laughed! Jamie Green (who compere’s the Wise Crack Comedy nights in Cambridge) was hilarious, and Candy Gigi was just brilliantly odd! Sean Cannon, Nigel Lovell and headline act Jenny Collier all had us laughing out loud too. But a special mention must go to Ali herself – she organised the whole event and also brilliantly compered the evening and made everyone feel welcome. If you fancy a night of comedy – or just a night with a difference – then I highly recommend going along to one of the Commoners Comedy nights. They’re on the second Thursday of each month and usually run from 7:30pm until half past ten. If the comedy’s not your thing though, it just so happens happy hour at the Cornerhouse is currently from 7-8pm, and if comedy is particularly your thing then why not get along to one of the Commoners Comedy Open Mic nights (on the last Sunday of each month). 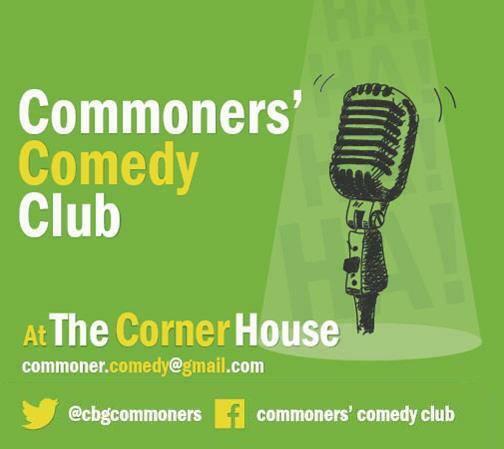 COMMONERS COMEDY – Thursday 9th July, The Cornerhouse CB5 8JE. 7:30-10:30pm, tickets £3 adv / £5 on the door. Full details and line up here. Veggie Pub Grub Pop Up! There’s certainly a foodie vibe going on around Cambridge the moment, as demonstrated by the number of supperclubs and food-related events happening locally and new eateries opening across the City. Many different tastes and cuisines are catered for, and now there’s a new pop up in town – the Veggie Pub Grub Pop Up! This new venture is the brainchild of Sam Dyer and Jennie Debenham, both known locally for their love of vegan food. Starting Monday 24th February, the pop up will run for six weeks at the Alexandra Arms on Gwydir Street, on Monday and Tuesday evenings from 6-9pm. The menu promises a whole host of vegetarian and vegan food delights, as well as gluten-free options. Sam and Jennie are trying to source their food locally, including having their bread created for them by Bread On A Bike. You can just turn up on the night, but word is already spreading fast so it’s advisable to book in advance – just call The Alex on (01223) 324448. Famed locally for her delicious vegan cupcakes, Sam is no stranger to the local food scene – she has run her own catering business, Mouth Music, as well as the kitchen at Arjuna on Mill Road, she has supplied food to hungry hordes of volunteers over the years at events such as Strawberry Fair and has also been part of the team behind the Wild Thyme Community Cafe. Jennie is also known for her food exploits and created the Liberated Feast – a vegan banquet that sources food from surplus produce that would otherwise go to waste (look out for the next one on 6th April!). More information about Sam and Jennie’s menu will be revealed on their facebook page later this week, but I was lucky enough to hear a sneak preview yesterday and can tell you that it is going to be delicious – I’m not even a veggie, but my mouth was watering when I heard about the dishes planned for the menu! Right, I’m off to book a table… . An overall winner will be announced at the Mill Road Winter Fair on Saturday 7th December, and now’s your chance to vote for your favourite – just make sure you fill in a voting form while there’s still time. It great to see the traders and businesses around Mill Road doing so well, the best way to show your support for them is to use them – and of course vote! Mill Road is known for the festive light display of giant snowflakes adorning its shop fronts in the run up to Christmas and the beautifully lit large trees at the top of Gwydir Street that can be seen from a distance; and this year will see the addition of new trees at the top of Cavendish Road and near the corner with Ross Street as well as a Switch On event at Cambridge Bed Centre. A team of volunteers organises and raises funds for the Mill Road festive lights and they begin planning several months ahead of the festive season. Their work includes organising PAT testing and repair of the lights, as well as installation, take down and the organisation of the Switch On event. The group are a not-for profit community organisation and have received a grant from Cambridge City Council as well as sponsorship from many of the businesses in the Mill Road area and help from a number of local residents. They are always looking for volunteers to join them, if you would like to get involved or make a donation then do visit their website for more info on how you can help. This year the Switch On event will take place at Cambridge Bed Centre on Mill Road on Sunday 17th November. There will be a lantern making workshop for little ones at Ross Street Community Centre from 4pm, with a procession of the lanterns making its way to the Cambridge Bed Centre at 5:15pm. The festivities include stalls and entertainment at the Bed Centre from 5pm, including music from local community radio station Cambridge 105, Elliot Porter & The Missing Pieces and The Hot Lights; as well as the ever popular Steak & Honour burger van and a barbecue by local legend Carlos from Mill Road’s very own Bosphorus restaurant/take away. There will also be a tombola/prize draw and the lights themselves will be switched on around 6:15 by Romsey resident Councillor Paul Saunders, the Mayor of Cambridge.